Confirm this is really the place we want to retire to as soon as possible. Vacation. Have some "down time" and relax. Take it easy. Projects to prepare for our move and full-time life at the cabin. Check off number 1. There is no doubt. We had to balance between #2 and #3. Even on vacation there is always a long list of chores and projects to do. The cabin requires maintenance, for example. Batteries need distilled water. Windows need washing. Etc. I thought we'd get more #3 projects done, but we got some big 'uns covered. I wanted to get our mailbox installed at the Wooden Shoe Ranch. But, I could not find a mailbox mounting pole anywhere in Laramie. So, a neighbor has volunteered to install it while he does maintenance on a couple of existing mailboxes. 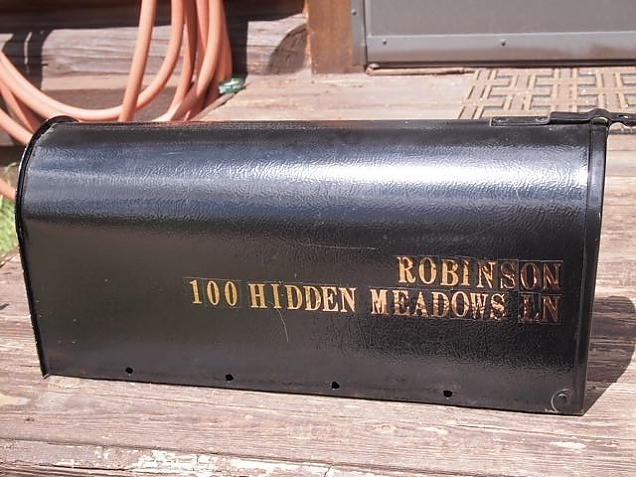 The mailbox itself is ready, with our address labeled on the side and front. I've written a letter to the Laramie Postmaster asking for mail to be delivered to the box. We'll see. Mailbox is ready for mail! One small project was to repair the plumbing vents that have been broken by the snow. These have broken and been fixed before (making this fix more challenging). This time, I added some strapping to hold them vertical even with a large snow load pulling them over. I think this will work fine. Maybe this strap will keep the snow from breaking the vent pipe. Sam Burnham our "off the grid" power resource came by. She and her new apprentice John went over all the projects we have planned for her. We are going to add about 1500 watts of PV to our existing (800 watt) system. Lynne proposed a location for the solar panels (which is brilliant) and we confirmed it was an excellent location. So, those will be installed sometime this summer. We are also replacing our 13-year-old batteries. And, growing from 8 batteries to 12. Having twelve batteries will give us additional power during times when there is little sun or wind. But, they need the additional charging the new PV will give us. The new batteries will likely be installed at the same time as the new PV panels. We will need to re-commission our wind turbine, too. We discussed it, located the tie-down points for the guy wires. Etc. But, that project will wait until we are here. No need to run a piece of mechanical equipment to generate electricity no one will use while the cabin is vacant. We also discussed the installation of a propane powered generator. 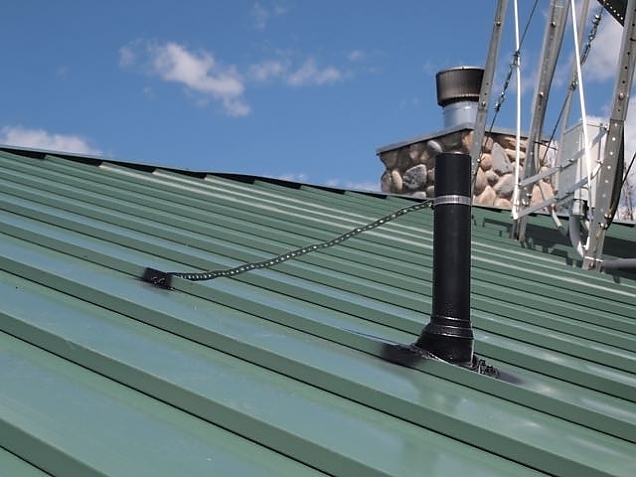 That was also a project for this summer, but due to the complications associated with selecting and installing a generator, that project is now "on hold" until we are here for a while. The other big project we had on the list to help us prepare for full-time living is a new shed/garage to use for storage and a small "shop" for me. 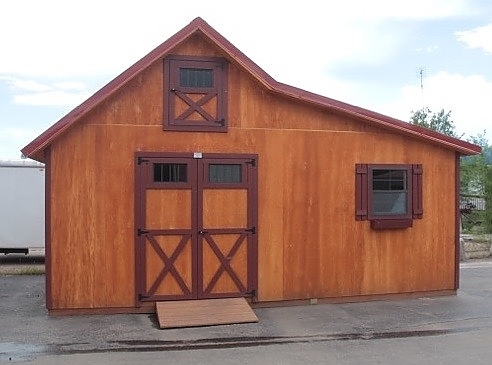 We selected a pre-built unit that is perfect for out needs at Rocky Mountain Barn in Ft. Collins. But, we won't actually order it and have it delivered until we are settled here. But, we did select a location and met with Oscar who is a full-timer up here and also an excavator. This is what our "barn" / shed / garage / workshop will look like. Except, I think we'll do a greenish stain instead of this reddish one. Also, there will be two doors on the front--the one you see which goes into the shop area and another where the window is for the ATV. Oscar will do three excavations for us soon. Two are small, one is big. The big one is to excavate a 24' x 24' space for the shed (which is 20' wide by 14' deep). The two smaller projects are to level a spot for the travel trailer (a good place to put guests! ), and to move some dirt to create a place for a wood shed. I made measurements for the installation of a drain for a washer/dryer combo unit. Also, a commercial plumber with a cabin not too far from us dropped by and confirmed my plans. I think I can do the plumbing work in the future without too much problem. So, while it feels like we did not do everything I planned to get us better prepared for living here, a few of the biggies will be done. We will be in great shape for solar power. And, we'll be ready to order and install our shed/garage and host visitors!